1) Introductory Interactive Workshop -Rates From £480.00 for a Quartet – 3 Pan Performers & 1 Percussionist – 8 Classes a Day. For Smaller Budgets 3 performers facilitators will be used. 2) Interactive Tutorial Workshop – Rates From £660.00 for a Quartet of Performers and another 6 Additional Drums . Can accommodate a class of 20 , the students will play a recognisable tune at the end of the workshop – 4 classes a day can be thought. For Smaller Budgets 3 performers / facilitators will be used. Workshops can be for classes combined or for assemblies. 2) Playing Carribean Tunes or Popular Pop Songs and getting the students to guess or recognise them. 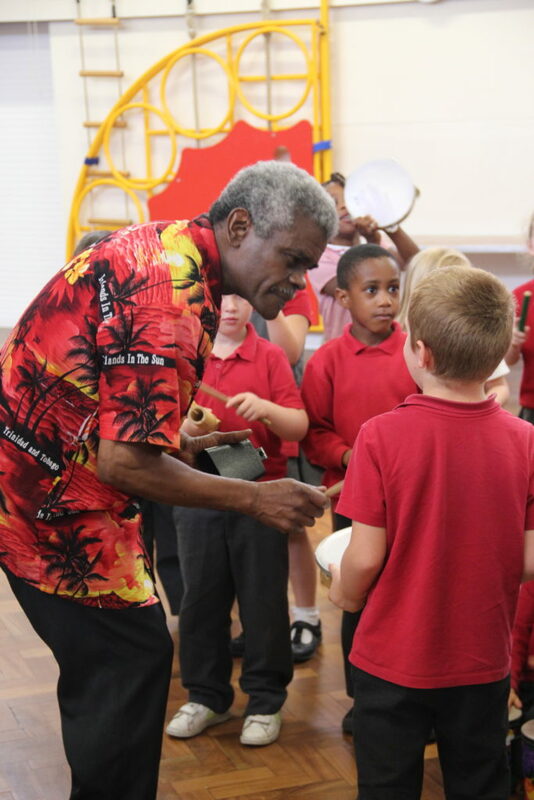 3) Short Lecture of the brief History of the Steel Drums. This is done interactively by asking the students if they know where Steel Drums are from and if they knew the history before providing the correct information. 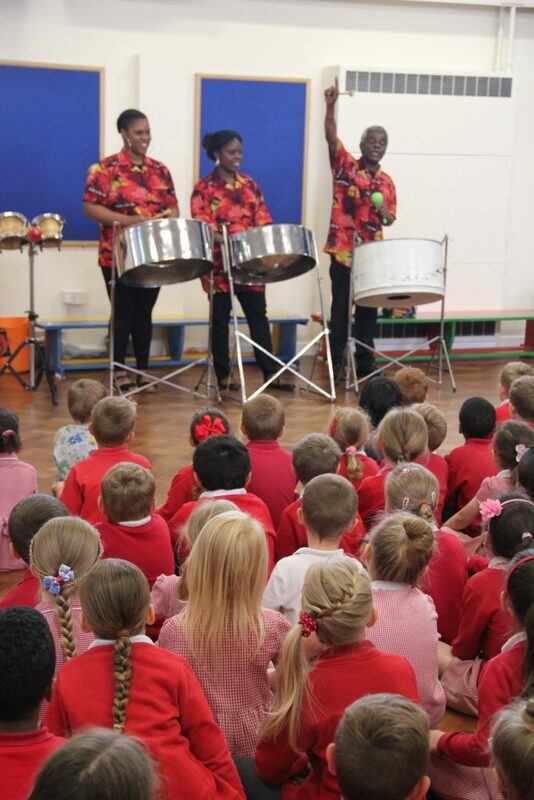 4) Play a Traditional Steel Pan Song from Trinidad – Then go on to explain what each instrument was doing musically. They will explain the differences between each instrument and the different sounds it makes. Example the smaller notes make the highers sounds and the larger notes in the Steel Drum make the lower sounds. This is done in an interactive style to get the students to respond and contribute towards the discussion. The tenor pan, soprano pan and Bass Pan distinct characteristics and funtion will be explained. 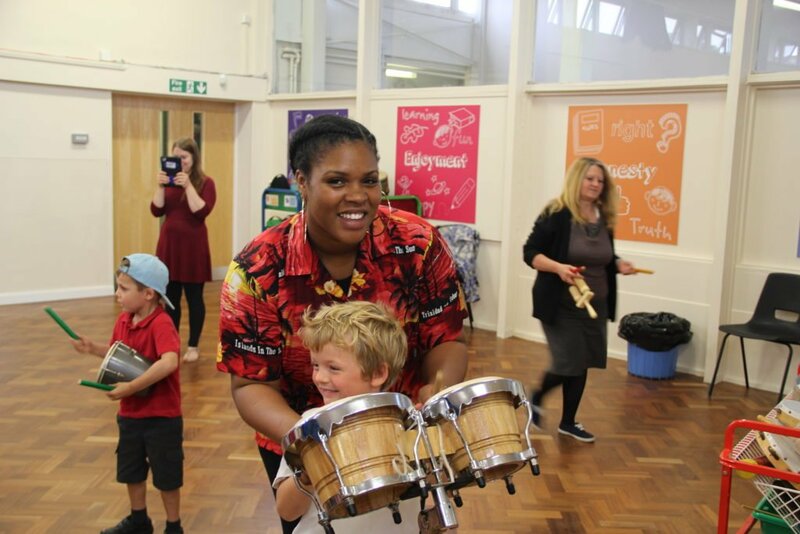 5) Some of the students will be on percussion , they will be taught a rhythm and the words in line with a Carribean song being taught. 6) The students can then try the drums to get a feel of the drums towards the end of the workshop. The typical day starts with an opening performance at the assembly. The facilitators / performers are then stationed in one class – individual classes then attend a session lasting 90 minutes or 2 shorter session. The workshop schedule and plan will be as above, in addition the children will then be taught to play a tune. They will be given more guidance on the notes and chords. There will be additional Steel Drums for Students to participate and learn and it would be approximately three students to a drum. Children will play a recognisable tune at the end of the workshop. Though there are two formats to the workshops, each format, to a certain extend can be catered to the specific requirements of each classroom.